1.8W solar panel makes higher water fountain and works efficiently. Easy to install the pump and use the fountain. Comes with different sprayer heads for squirt different water patterns. 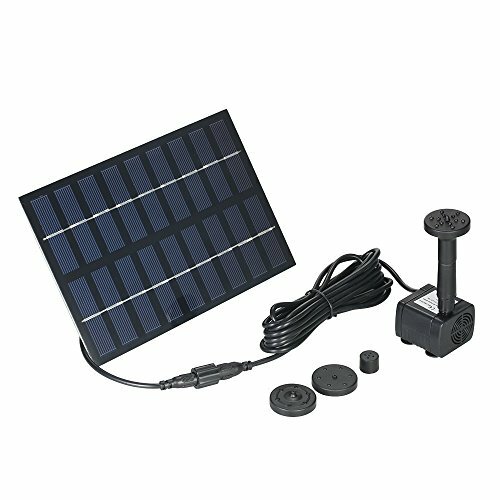 10.8 long power cord for easily moving the solar panel and get the best sunlight. Please make sure the solar panel is not shadowed and keep the filter intake on the bottom clear of debris. Much better than all-in-one fountains! I bought a decorate clay pot and put river rocks around the pump inside the pump. I put this in a decorative bucket on the corner of my wall. Makes for a great fountain. This was a great addition to my backyard!!! Powered by the sun. Works great! Awesome little fountain! My Mom's hummingbirds are very happy.